Enriching the physical bookstore experience. 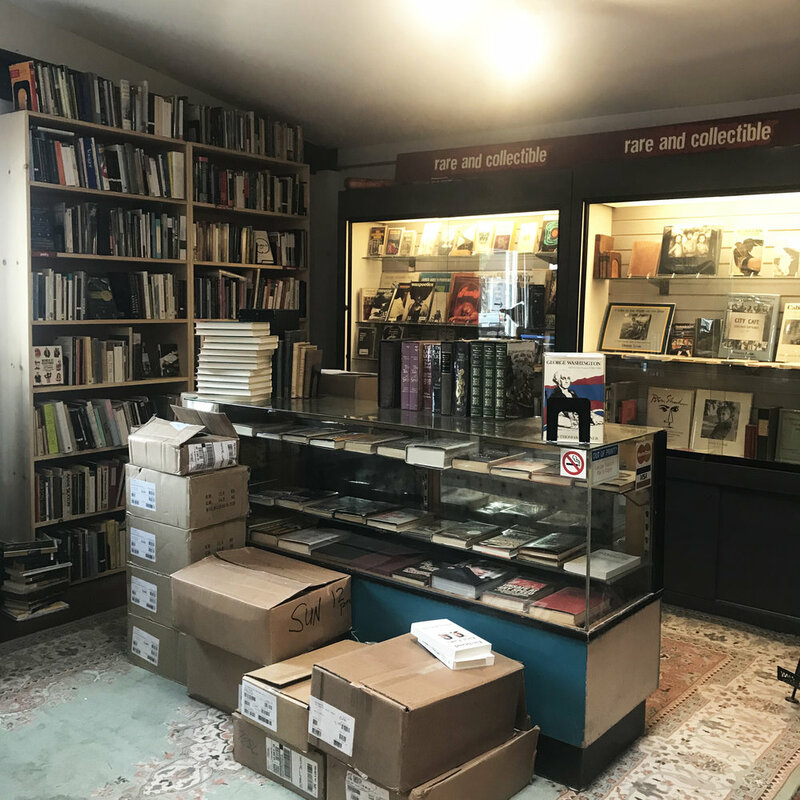 With the rise of e-books, e-commerce and the increasing ubiquity of media, physical bookstores are now situated in a significantly different context than they were before. For digital natives (individuals who have grown up in the digital age) in particular, browsing for books online versus in physical bookstores represent fundamentally different experiences: while online browsing often lends the benefits of cost and convenience, physical bookstore browsing is far more immersive, social, and serendipitous. Given the easily quantifiable benefits of online browsing, such as cost and convenience, how might we highlight and enrich physical bookstore browsing for digital natives so that it stays competitive with the online experience? I helped develop research objectives, conducted a literature review, helped create the survey, conducted observations, conducted 3 in-person interviews, and used affinity mapping to analyze our qualitative findings. I also helped create the task analysis, created the personas, helped create our usability testing protocol, and conducted several user testing sessions. My biggest takeaway from this project was that prototypes should always be created with the research goal in mind. This not only saves time and resources, but also ensures that the entire team is aligned. I also learned that pivoting is terrifying but also necessary at times. And so long as the team is diligent with the change of plans, everything will be okay! What are digital natives’ general tendencies? Why might a digital native buy from a physical bookstore rather than online? What are our users’ pain points? To take advantage of the existing research and get a grasp on the social context of our problem space, we conducted an informal literature review. Referring to the original article which coined the term ‘digital native’ by Marc Prensky (2001), as well as several related articles about digital natives and how they tend to interact with books, we were able to create more tailored research objectives to further investigate through a survey and observation. Digital natives feel like they are bothering the bookstore employees when asking for recommendations. Digital natives prefer to make informed decisions for themselves as opposed to accept recommendations. Digital natives want a stronger sense of agency in the book browsing process. The entrance of one of the independent bookstores we visited. Think about the last time that you went to a physical bookstore. How would you describe the role of a bookstore associate? One of the large chain bookstores we conducted the contextual inquiries at. We found that, on a continuum of concrete to abstract experiences, users feel that physical bookstores land in the middle. Concrete: users expressed that physically holding books, flipping through pages, and walking through genres were critical parts of the physical bookstore experience. Abstract: users also spoke about the immersive aspect of bookstores, and how the atmosphere of the space and vast book selection represented discovery and possibility. On a spectrum of private to public social contexts, users believe that physical bookstores serve as a middle ground. Private: users stated that reading a book during browsing is a very internal, private experience. 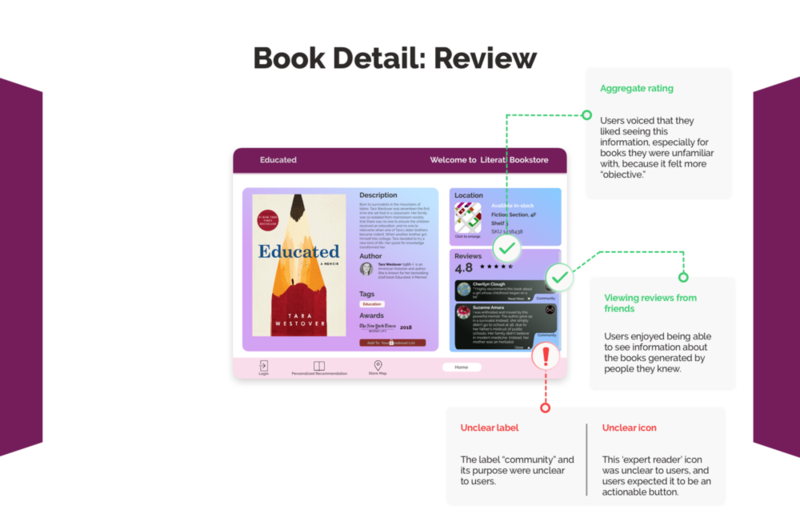 Public: users also stated that bookstores afford users access to books that are released and discussed very publicly, such as in online reviews and in the media. Many users stated that they see physical bookstores falling on the ‘community’ level of public versus private. 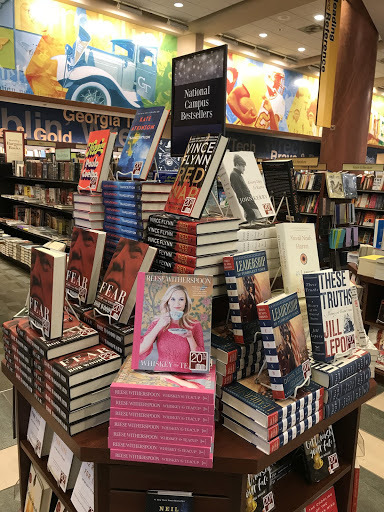 Especially regarding independent bookstores, users stated that they see the store’s selection as curated, reflecting books that are both locally popular and nationally trending. Browsing mindset varied widely among users, but being in the middle feels uncomfortable. Task-oriented: some users arrive at the bookstore with a specific book in mind and go directly to find that book. Open: other users go at the bookstore with the intention of discovering something new and letting the experience lead them. When users are not committed to one mindset of the other, however, this leads to feelings of uneasiness, anxiety, and/or guilt. For example, several users expressed that when they enter a bookstore, they feel obligated to have a task, but also want the experience to lead them. This internal conflict leads to an overall, uncomfortable experience. At this point, we realized we were facing a major issue of scope: it was far too large. Given the findings from our research, the user group of ‘digital natives’ was too broad for the timeline of this project and so was the goal of “enriching physical bookstore browsing.” The differences in browsing mindset within our user group would have far-reaching design implications, and as a team we agreed that enriching the browsing experience for task-oriented users would require a very different approach than for open mindset users. How might we help users in the 'uneasy in-between' shift their mindset towards having a more open, discovery-oriented mindset? The idea behind this concept is that each physical, genre location within the store would be paired with a corresponding playlist, curated by store associates. The playlist would be played through a directional speaker system, which could be granularly adjusted to where the music is audible. Only users standing within a specified zone will be able to hear audio from specific speakers. Our initial hypothesis with this solution was that the audio experience would encourage users to browse genres that they would not otherwise be interested in. Sketch of a user browsing, in an Ambiance zone. This concept was inspired by shelf markers in elementary school libraries, that help students remember where books belong on the shelf. 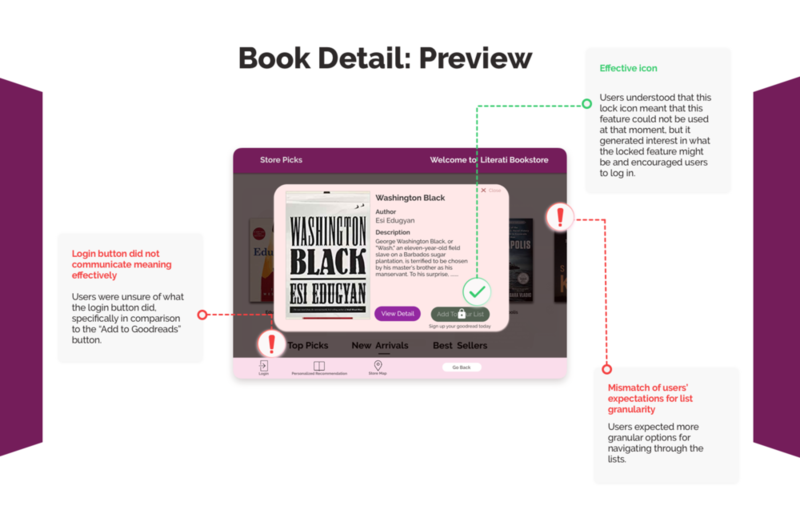 The rationale behind this solution was that it would lower users' barrier of entry to removing a book off a shelf and flipping through and reading it. Additionally, the Placeholder would prompt users to ‘like’ or ‘dislike’ a book that they just removed from the shelf and generate an artifact of the bookstore visit (a list of the books they reviewed and the users’ corresponding ratings), which the user could then send to their email or Goodreads account via an in-store kiosk. Leftmost: A (very) lo-fi prototype of this concept we made during a meeting; Middle/right: a higher-hi prototype. Gateway is an interactive tabletop that takes on the role of a traditional ‘welcome table’ at the front of physical bookstores, which highlight categories like ‘Bestsellers’ and ‘Staff Picks.” By displaying information in this digital format, users are able to view a wider range of information than is traditionally available at welcome tables. Traditional welcome table near the entrance of a store. Initial sketch for what the table might look like. 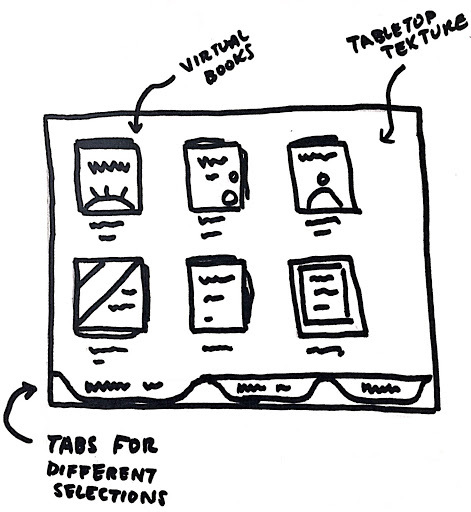 Initial sketch for what the table’s screen might look like. Mockup of table’s form (screens shown above are from a previous iteration). Assess whether users can successfully complete critical tasks using the prototype. Find a book that you’re interested in. Add this book to your Goodreads ‘Want to Read’ list. Check out your personalized reading list.